There's never enough freezer space in your refrigerator/freezer combo. A Maytag freezer is a simple solution to this problem. Affording you additional freezer storage space, homeowners can store items that don't fit in the refrigerator. If you prepare large meals or purchase items in bulk, freezing them is an excellent way to preserve them. Freezing foods not only avoids spoilage but also allows you to store your favorite meals for later consumption. So, you don't have to toil in front of the stove on days you don't feel like cooking. Or, when hosting a last minute dinner party, you no longer have to worry about making a huge meal. Just grab a few frozen meals and finger foods from the freezer, and you're ready to serve. Don't worry about dinner when you get home late after a long day at work. Grab a frozen dinner in the freezer, for a stress-free evening after a hectic day at the office. Maytag is one of the leaders in both kitchen and household appliances. The company sells a wide range of products from dishwashers to refrigerators and freezers. In business for over 100 years, it stands behind the efficiency of its products. The company offers a 30-day quiet guarantee promise and a 10-year warranty on many appliances. Consumers can rely on the quality of the products they purchase. When choosing a new Maytag freezer, it's important to consider the essential features for at-home use. If homeowners have a family of 10, more internal capacity is probably more critical than a soda storage compartment. For those storing items for long periods of time, a defrost mode might be a relevant feature. Adjustable shelving, hanging baskets, and additional storage drawers, are some other important features to look for in a freezer. Depending on the internal capacity of the freezer, each model features varying levels of usable storage space. When comparing Maytag freezer models, it's important to understand the storage limitations and organization options. Doing this helps homeowners find the best model, with sufficient storage, for items they plan on keeping in the freezer. Every home is different, so the additional features homeowners look for will vary in each case. However, having some simple design features will help improve overall efficiency and use of the Maytag freezer. Most freezers today are more efficient than models that are 10 years old, or older. However, not every freezer features an Energy Star certification. For those who want to reduce electric consumption costs, it's important to look for a freezer that is. It costs less to operate year-round because it doesn't require as much force to power the freezer. A freezer with manual defrosts also operates quietly. That's because it doesn't run the compressor as often as an automatic Maytag freezer does. Checking Consumer reports is a good indicator to help homeowners find the most efficient freezers. When comparing the best Maytag freezer models, we consider several variables. Storage capacity and ease of internal configuration adjustment are two critical factors. Homeowners should have the ability to adjust shelving freely, so this is an essential aspect of our review. The price to help budget-conscious customers find a great freezer is also a factor we include in the review process. Additionally, we incorporate owner reviews of the top freezer models. Doing this provides consumers more detail, from people who own the Maytag freezer, to help them find the best model. Several online sites carry the best Maytag freezer models. Home Depot and the Maytag website are a few online sites to consider purchasing. Prices vary depending on models and the retailer consumers choose to purchase. Average prices fall from less expensive to expensive for the best Maytag freezer models available online. With several Maytag freezer models to choose from, it's important to compare several models. These are a few of the best available for at-home use. The frost-free freezer model eliminates the need for homeowners to defrost it routinely manually. It comes with a 10-year warranty on the compressor and parts. The freezer has an LED indicator light while open, so owners can quickly find items they desire in a freezer. The upright freezer has adjustable shelving and foam on the doors. This feature helps prevent foods from sticking onto doors if kept in the freezer for long periods of time. Five-door shelves also increase internal capacity of the 15.7 cubic foot freezer. Some reviewers indicate that it takes longer to have service technicians visit the home in case of repair. Although parts are under warranty for 10 years, it is difficult to get a service team out for replacement. The price for this freezer has an average cost. Home Depot customers rate this Maytag freezer 4.5 out of 5-stars. For homes in need of higher storage capacity, this Maytag freezer offers 19.7 cubic feet of interior storage space. It also features a frost-free design, so manual defrosting isn't necessary. The freezer has the 10-year warranty on parts and the compressor as well. It has the LED indicator light when the freezer is open. This light helps reduce consumption costs if homeowners forget to close the doors. It also makes it easy to find items in the dark. The freezer features a fast-freeze option. It allows homeowners to set cold temperatures, to lock in freshness and better preserve foods which are nearing expiration. Unlike the smaller model, this freezer doesn't have a bottom shelf. Items tend to freeze onto the bottom lining of the freezer. Homeowners complain that the elimination of the bottom shelf dramatically reduces usable interior storage space. The average price for the freezer is less expensive compared to others. The online ratings are 4.4 out of 5-stars for this freezer model. A 10-year warranty on the compressor and parts provide owners peace of mind that their investment is safe. It has an LED indicator light, and four adjustable, full-width shelves. A built-in storage gate is perfect for storing fruits or frozen veggies to utilize internal storage space fully. There are six full-width door shelves and a fast freeze option. These features allow owners to set the temperatures 10 degrees F colder than average, to quickly chill items. The freezer also has a reversible door hinge, optimizing set up in any kitchen space. The freezer doesn't feature an audible alarm when open. If owners forget to close the freezer, this will increase energy consumption and waste. The bottom shelf doesn't have a pull-out drawer either. This elimination of the bottom shelf reduces overall storage capacity. This freezer's price costs is average. The Home Depot rating for this model is 4.4 out of 5-stars online. This chest freezer is great for compact spaces. It has two pull-out storage chests, making it easy to arrange foods in the storage compartments. It also has the 10-year warranty on parts and the compressor. The freezer has a temperature knob on the exterior, allowing owners to modify as necessary without opening the freezer. The freezer chest has two large storage baskets. This design allows for internal storage and removing the baskets to store items beneath them as well. The model also has an interior light when the chest is open. Owners complain that the freezer temperatures fluctuate throughout the day. They can differ by as much as 20 degrees to 35 degrees F, at different times of the day. The average price of the freezer is less expensive compared to others. The ratings for this Maytag freezer model are 4.5 out of 5-stars. This freezer has a key lock, which other models lack. This design is great for child safety and also to ensure items are safe in the freezer. Especially in a commercial facility. The model also has the LED indicator light, and the 10-year warranty on parts and the compressor. The large 21.7 cubic foot capacity is one of the most significant models available. It also has a manual defrost mode and convenient external temperature knobs on the doors. Some reviewers complain that although there are four storage baskets, they don't offer much internal storage space. The smaller baskets can't store much, limiting how much interior space owners can utilize. The price for this Maytag freezer is average. Home Depot customers rate it 4.2 out of 5-stars. The Maytag freezer comes with the 10-year compressor and parts' warranty, as well as a door lock for security. The internal storage space is ample. With no drawers or baskets, owners can utilize the entire storage area. The freezer has a large interior capacity, yet it doesn't take up too much space in the home. It is a great model for tight spaces or rooms with minimal storage capacity. Some reviewers complain this model is noisy while it is operating. Unlike other models, it has a manual defrost mode. Without this feature, it means the compressor does not work as hard. However, it also says the freezer tends to freeze up, requiring defrosting regularly. The MSRP for this freezer has an average cost. Maytag customers rated the freezer 4.7 out of 5-stars. This freezer has the LED indicator light, lock feature on the door, and extensive internal storage capacity. It features a reverse door hinge, and foam insulation helps reduce energy consumption. The freezer has a smooth external finish and auto-defrost. This feature helps prevent icy build-up on the interior walls and around the compressor of the freezer. The price is one of the significant drawbacks of this model. It is expensive, and it does not offer many additional features than smaller models. Apart from a little extra storage space, the freezer doesn't provide many other benefits to owners. It lacks a child safety lock as well. The MSRP price on this Maytag freezer is average, and customers rate it 4.7 out of 5-stars. This Maytag model has the fast freeze feature. This design feature allows owners to set the temperatures 10 degrees F colder than the lowest temperature. They can do this for up to 24 hours. It will enable owners to quickly freeze foods and prevent spoilage of items nearing their expiration dates. The freezer, like other Maytag models, has the 10-year warranty on the compressor and parts. It also features auto-defrost, and interior foam insulation, to help prevent icy build-up throughout the freezer's interior. Some reviews indicate issues with functionality after a few months after ownership. For example, after a few months, the interior LED light no longer works in the freezer. It wasn't due to the bulb, but an actual malfunction with the freezer. Reviewers indicate concerns with the longevity of this upright freezer model. This Maytag freezer has an average MSRP , and customers rated it 4.8 out of 5-stars. With many models to choose from, homeowners can find the perfect Maytag freezer for any space. Those who are on a budget will like the 15.7 cubic foot upright freezer. It is slim and doesn't take up too much space in tight rooms. The freezer also has the auto-defrost mode, and bottom liner and storage drawer. It also features the interior LED light. It does lack a child safety lock. However, low operational costs and generous storage capacity make up for this. And, a meager price, make it a great model for those who are on a tight budget. For those who want the best, regardless of price, the Maytag 20 cubic foot freezer is it. It features an enormous interior storage capacity. The freezer doesn't have a door lock but has auto-defrost and several storage shelves. The frost-free mode helps prevent icy build-up on walls. The 10-year warranty covers the parts and compressor. Quiet operation and interior foam insulation, further help reduce operational costs of ownership. In the book Mosh Potatoes, a member of the band L.A. Guns talks about the compact freezer on the band's tour bus. What is a Compact Freezer? How Do You Choose a Compact Freezer? The freezer holds twenty single-meal sized containers of their favorite "Stage Stew," so that they don't have to waste money on fast food while out on tour. Are you off on a road trip? Or maybe a day out on a boat? A compact freezer is a convenient and robust alternative to an ice chest. Or perhaps you're doing some entertaining at home and looking for something to hold the ice for your famous margaritas. Whether at home or on the road, a compact freezer might be the solution to your cold storage needs. There are four basic freezer sizes. A large freezer has 19 cubic feet of storage space or more. A mid-sized freezer will have between 10 and 18 cubic feet. A small freezer can store six to nine cubic feet of frozen goods. A compact freezer will have less than that -- generally around five cubic feet of space. If you're looking for something to fit under the counter of your bar at home, or to sit next to the pool during a party, then you're looking for a compact freezer. Aside from size and price, there are a couple of factors for which you should look. According to the FDA, a freezer should be able to maintain a constant temperature of 0F, or -18C. All freezers can reach this temperature, but the temperature outside of the freezer may affect the freezer's capacity to stay there. This is especially true if you're using your compact freezer outside. Some freezers can maintain a safe temperature despite outside temperatures, while others may have a more difficult time of it. Is your freezer going to stay in one place, like the garage or under the bar? Or are you planning to take it on a boat or in the car? Either way, there's a freezer for that. If you've ever defrosted a freezer, you know it's a pain in the neck. So if you want to avoid the trouble, look for a compact freezer with a self-defrosting option. How would your freezer handle a power outage? If you live in an area prone to blackouts, this is definitely something to consider. There is a surprisingly wide price range for compact freezers, and it doesn't always correspond to storage capacity. You can find a highly rated unit for an average price, or you can pay two or even three times that. The important thing is to figure out your price limit. Then see which features are dealbreakers for you, and try to get the most compact freezer for your money. We consulted trusted expert review sites like Consumer Reports, CNET, and others, to find which compact freezers they thought were worth your money. Then we researched feedback from actual consumers to see how they felt about their purchases. In this way, we hope to bring you a well-rounded, unbiased picture of the best compact freezer models out there on the market today. Which is the best? That depends on your needs. There are larger compacts and smaller ones. There are freezer-only units, as well as compacts that can toggle between freezer and fridge based on your needs. Plug-ins need to stay in one place, and portables you can take with you. Which features are your dealbreakers is something you'll have to decide for yourself. Below, you'll find some fantastic and varied suggestions. This top-loading unit was the only compact freezer to make the Consumer Reports recommended freezer list. In particular, they rated it highly for thermostat control, temperature uniformity, and energy efficiency. With five cubic feet of storage, it's one of the larger compacts. It also has an adjustable temperature range. This is a plug-in freezer, so you probably won't be taking it on the road with you. However, if you're looking for somewhere to keep drinks cold at your next party, this one is pretty hard to beat. Keep in mind that this freezer has a manual defrost, so if you have your heart set on an automatically defrosting compact freezer, this might not be the model for you. 100 percent of consumer reviewers at both Amazon and the Haier website rated this unit four or five stars out of five. This unit is available on Amazon. Removable storage basket. Provides flexible organization options for your frozen items. Insignia is the Best Buy house brand for many different kinds of electronics. You're probably most familiar with the brand as it relates to televisions. Different manufacturers produce appliances that Best Buy sells under the Insignia name. Some of these manufacturers include Samsung, Toshiba, and LG. This little freezer is on the smaller end of the compact scale, with a capacity of 3.5 cubic feet. This, also, is a plug-in unit, as well as a manual defrost. We've put this one on our list because of the huge number of happy customers who bought this unit from Best Buy. 79 percent of nearly 700 customers gave it five stars out of five, and that's pretty impressive. Customers liked how quietly this model runs. They also report it keeps food frozen consistently and effectively. This is an interesting little unit for a number of reasons. First, this 43-quart capacity unit is both a refrigerator and a freezer -- you choose and set it based on your needs. Second, it has a flash-freeze function, for rapid cooling to -8F. Third, it runs on both AC and DC power, so you can either plug it in or take it with you. It's a bit more cool than the typical chest freezer, but it sure looks fun, and it's getting some great reviews. EZ VID considers it one of its nine favorite chest freezers. What's more, 75 percent of Amazon verified purchasers gave this unit four or five stars out of five. Customer complaints focused on this model's lack of durability over time. And given the price tag, one might expect better. All the same, this compact freezer has some unique qualities, and it might be well worth a look. You can find it on Amazon. This is a very small unit, with 2.1 cubic feet of freezer capacity, though there's a three cubic foot capacity model available as well. Despite its diminutive size, it's getting a lot of enthusiasm from consumers and professional reviewers alike. This is another compact freezer that can do double duty as a plug-in or battery powered portable. Like the above model, it also has a fast-freeze function, and it can function as a refrigerator as well. 77 percent of Amazon purchasers gave this model 4 or 5 out of 5 stars. It was also a favorite at Consumer Research. Customers liked its low power consumption and its temperature stability. They also considered it good value for money. With 5.3 cubic feet of storage space, this is one of the larger compact freezer models. Consumer Reports calls Amana one of the "brands that matter,"and with good reason. 21 out of 27 Home Depot reviewers rated this particular unit five stars out of five. In particular, they were pleased with the unit's steady temperature control and its ability to get down to optimum temperature quickly. Top Ten Reviews gave this unit its Silver Award, specifically citing its quiet operation and generous interior capacity. If that's not enough, this top-loading impact freezer also has a fast-freeze function that will bring the temperature down to -8F very quickly. Plus, it's Energy Star certified. This is a plug-in, manual defrost unit. It is rated for use between 32 and 110 degrees Fahrenheit. Danby might not be as famous a name as Amana or Frigidaire, but a lot of people buy and like their products. This chest freezer is available in five different sizes: 3.2, 3.8, 4.3, 7.2, and 8.5 cubic feet. It's a top-loader, a plug-in unit, and it has manual defrost. One big selling feature of this particular unit is its environmental friendliness. First, it uses a special coolant called R600a, which is a non-toxic, high-performing refrigerant with zero ozone depletion potential, and very low global warming impact potential. The cabinet and lid are insulated with foam, which make it even more energy efficient. Customers really love this unit. 82 percent of more than four hundred Amazon purchasers gave it 4 or 5 stars out of 5. You can find it at Amazon and Home Depot for an average price (for the 3.8 cubic foot unit). This 3.1 cubic foot compact freezer is one of Amazon's top customer-rated units, and if you look at the specs, it's no surprise. The Midea WHS-109GFW1 is a front-loading, plugin unit, with a door that you can adjust to open from either the right or the left. This makes it handy for lefties, as well as better able to fit into tight spaces in your dorm room or under the bar. This unit is available from Amazon for an average price, depending on the finish. You'll pay dearly if you want it in stainless steel! If you don't mind white plastic, however, you can get the lower price. 83% of more than 400 Amazon purchasers gave this compact freezer 4 or 5 stars out of 5, citing quick freezing and quiet running. Complaints seemed to center on damage sustained during shipping. So, which is the best compact freezer on the market today? It was hard to pick, we have to admit. For general purpose use, we liked the Danby. First, we liked the numerous environmentally friendly features the company thought to include. Although the most commonly used refrigerant in the United States, tetrafluoroethane, is better than the freon it replaced, it's not a perfect solution. Indeed, it is becoming less and less common in Europe and around the world. Using the non-toxic, zero-impact refrigerant R600a is a small step in the right direction. And the many positive customer ratings speak for themselves. If you're looking for something to take on the road with you, however, we'd go with the Whynter compact freezer. Not only do reviewers and consumers consider it good value for money, but it rated well for both power consumption and temperature stability. Which compact freezer will work best for you? Only you can decide that. There are a lot of great choices out on the market to choose from. It’s been a long day at work. You are starving. All day you’ve been thinking about the package of steak that you put in the freezer last week. It is just what you need to forget about your boss, your burgeoning to-do list, and your worries. But when you unwrap your hunk of meat, your heart sinks. The beautiful steak you had so carefully crafted in your mind to be the centerpiece of your dinner has freezer burn. Luckily, with a little bit of information, a little bit of planning, and a lotta bit of freezer space, you can protect your food and eventually eat it, too. Why Don’t We Just Ice Out the Freezer? Who doesn’t love coming home to a nice frozen block of broccoli, right? The poor freezer has been aligned for too long with sad sacks of mushy vegetables, pints of ice cream you bought in moments of madness and forgot about, and the sack of bananas you swear you’re going to use to make banana bread someday. It’s time to stop the hate. Freezers can do and be so much more than you even know. The wonders of frozen foods never cease, and a little bit of freezer know-how can go a long way for your home and for your bank account. People have been freezing food for almost as long as we’ve been eating it. Ancient Mesopotamians dug holes and lined them with snow and hay to keep food cold. Later on, ice houses and ice boxes were all the rage: inside, big blocks of ice kept food and drink nice and cool, even during the summer months. Even leaders throughout history have been going to extremes to freeze and protect their favorite foods. Alexander the Great, George Washington, and even Napoleon understood the importance of cold food so much they got their peons to cut ice from rivers and even build early machines to create ice naturally. It wasn’t until the 1920s that the freezer we know and love today took center stage. ​General Electric​ invented and marketed the first modern-day freezer in 1927 and we’ve been loving them ever since. Just think: how lucky are you that you can now make ice in the comfort of your own home? But ice making and easy access to ice cream aren’t where the freezer benefits end. Boy, will you be amazed when you see what else that big box o’ cold can do for you. Is the Freezer a Magic Bullet? Although freezers are pretty fantastic, freezing your food isn’t a magical trick to make it healthy, safe, and beautiful. If only. … a freezer is a modern-day time machine! When you freeze food, whether it’s meat or fruit or veggies, you’re pausing any bacteria growth or food spoilage that had already started before you decided to freeze it up. Those bacteria don’t die, but they don’t multiply, either. This is a big deal. When you put something in the freezer, it’s like you’re sending your salmon to take a long cryogenic nap until you’re ready to pair it with some potatoes or pasta. It will wait, but can you? In the right hands, ice is a powerful tool. But just like not all people love the snow, not all foods love the ice. The world (and the internet) is full of pompous people showing off their freezers full of pre-made, ready to eat meals. And while you would certainly never stoop to that level, you too can have a freezer stocked with foods you know for sure will be just as fantastic when you take them out as they would have been the day you put them in. Get ready, folks, because this list will revolutionize the way you look at that freezer, the way you buy groceries, and even the way you think about your mother. Okay, so it won’t do that last one, but it’s seriously a pretty ​life-changing list​. Yes, For Sure, Freeze This Always. Why Aren’t You Freezing These Foods Now? Come on. Y’all know there’s still more food to freeze. Don’t leave out the baked goods. They may be less malleable, but they’re just as deserving of a spot in the front of the frozen foods section. Oof. Now you’re going to need a bigger freezer. Aaaaaand inevitably, some foods just don’t freeze super well. Don’t freak out, though. For some of ‘em, there are prep methods you can use to save ‘em. For others… well, maybe just find another storage method. Watch out with this one. You can freeze it, technically, and the flavor won’t be totally lost. But just so you know, you’ll never get that crispy crunchy cabbage back again. Plan to use frozen cabbage in cooked dishes if you know what’s good for you. This one’s pretty much the same. Instead of freezing whole stalks and then disappointing everyone with a soggy rendition of ants on a droopy log, just chop it into little pieces, freeze, and use in a soup or something where the texture matters less. Don’t just stick a handful of cloves into your freezer and expect them to be fresh as the day you bought them months later. The best way to freeze garlic is to throw the peeled cloves in some oil. You can chop them or keep them whole, but don’t leave your garlic-oil out in the real world for too long -- it can cause some serious ​bacteria growth​ and illness. You can freeze herbs, but try and think a little bit about what you’re going to use them for. Herbs are awesome when they’re stored in water -- dice it up, sprinkle it in an ice cube tray, fill the tray with water, and voila! You’ve got ready-made spice cubes for your next sauce, soup, or mojito. You can also freeze herbs, chopped or whole, in oil, just like the garlic of entries past. Who doesn’t have a stack of old bananas hanging out in their freezer? Just know, though, the texture (and sometimes even the taste) isn’t going to be the same as the one you pull off the grocery store stand. Mash these babies up and use them in a bread or a muffin, but don’t plan on grabbing one out of the freezer for a mid-morning snack. Okay, so these fruits are delicious and sometimes try to go bad before you even have a chance to enjoy them. You can stick them in the freezer, just consider letting them live in some syrup or juice. You’re not going to get the crunch or the texture, but the saved flavor will be worth it. It’s not a great idea to shove a whole bottle in the freezer, but if you like cooking with a nice splash of Pinot, use a standard ice cube tray to freeze just the right amount. It might even prevent you from drinking it before you can cook with it. This list is like considerably shorter, because the freezer is awesome. Don’t waste your precious freezer space with these anti-freeze losers. Notice a trend? Pretty much don’t freeze eggs. You just got home from the grocery store and your freezer is cold and empty. Stock away, my friend, stock away. But while you might have chosen the perfect freeze-able foods for your future consumption, you can’t just let them stay in there for​​ever. And remember, no matter what you’re storing, how long you’re storing it, or who you’re storing it for, pack. it. right. Keep on a’readin’ for those packin’ tips. It’s oxymoronic. The biggest issue facing our frozen foods today is burn! Protect yourself and the foods you love by learning your enemy’s biggest secrets. Only you can prevent freezer fires! Freezer burns and fire burns aren’t really all that different, when you get down to it. They’re both caused by exposure to extreme temperatures without the proper precautions or coverings. Freezer burn develops when you put food in the freezer without adequate coverage: that steak you got wrapped at the counter and didn’t re-package, for example. It’s the plastic’s fault, not the freezer’s! Freezer burn is a spot on your food where the moisture has all disappeared: it’s dehydration! It’s Here, It’s Near… Do You Have to Get Used to It? So you’ve got it. Now how do you get rid of it? Unfortunately, there isn’t a super great way to get rid of areas of freezer burn on foods. You can cut off the yucky looking areas, but you’re not going to reverse the freezer burn, sorry. Some superheroes are doing their best to combat that issue, though. Check it out, try it out, and publish your research to benefit the rest of us. Sometimes the food filling your freezer is covered in little crystals, or you might suspect something is full of the burn before you even open the package, but does that mean freezer burn? Freezer burn causes most foods to turn kind of grey and develop frost. It doesn’t mean it’s bad, unhealthy, or illness-inducing, but it might not taste very good. But before you get too worked up about your ruined frozen treats, check it before you wreck it. Freezer burn is one of a number of freezer-related food damaging concerns. Investigate. If your meat is the wrong color, it might be freezer burn… but it might also just be super dry. It might not make you sick, but it probably won’t taste good enough to eat. Fruits and veggies especially will lose their bright enticing colors over time, even when frozen. This is a pretty good sign that they’ve just been hanging out in the freezer too long. Make a smoothie, slurp it down, and feel healthy, productive, and not at all wasteful. This is a bad one. If you notice pools of juices in your freezer, clean it out and throw away the culprit ASAP. Your freezer probably thawed a bit, causing foods to thaw, too. The leftover juice can cause bacteria growth and overall gross. A bad smell is not caused by freezer burn, but it is probably caused by something insidious growing inside your food. Check it out and chuck it out. If, when you open the frozen food package, the product slimes out, it’s no good. It doesn’t suffer from freezer burn, but it does belong in the burn pile (or, more likely, the dumpster). Hallelujah! It’s the happy ending we’ve all been hoping for: even if it suffers from freezer burn, your steak is safe. You can totally nom the food that your freezer tried to steal from you. But be warned: it might not be quite the delicious dish you had cooked up in your mind. You won’t get sick, but you probably won’t be trying to freezer burn your food just for the flavor anytime soon. ​Nutrition experts​ even say that freezer burn might remove some of the nutritional value from foods, so maybe just don’t eat the freezer burn covered asparagus. Is Special Cooking Required to Eat Food with Freezer ZBurn? Freezer burn has infiltrated your prized cut of meat or your last bag of your favorite vegetables. But you don’t need to race to the grocery store just yet. Nothing special needed, just grab a knife, make sure you’ve got some adult supervision, and slice off the nasty bits. Or, you know, if the whole thing is covered in ice crystals and has a new grey-ish sheen, consider an alternative dinner plan. Guess what, though? If you haven’t already been burnt by your freezer, there’s still hope. Or even if you have, you can keep yourself from experiencing the misery all over again. The first step in your freezer rehabilitation plan is to wrap your food before you freeze it. Like, really wrap it. Keep all of that air away from your delicacies in the first place, and there will be no room and no way for freezer burn to develop. Next, don’t keep your foods in the freezer forever! Even if they’re wrapped with the skills of a "wrap god," eventually they will get freezer burn if you just let them wait and watch while you pull everything else out around them. Label those frozen foods with big bold dates to prevent the epidemic of forgotten frozen foods from infiltrating your household. When you’re freezing something that has been hot in a former life (think casserole, soup, pasta, and your favorite hot carrots), let that business cool down a tad before shoving it away. At least let ‘em meet room temperature before you rock their world with icicles. And most difficult of all, keep your freezer door shut. It’s easy and oh so tempting to stand in front of an open freezer door admiring your wealth and all of the lovely options available to you in your moment of hunger, but remember, air is the culprit here. No air on the food, no freezer burn on the food. So let the door do its job! Rule number 1: Wrap it right. Rule number 2: Don’t forget about it. Rule number 3: Give it a minute. Rule number 4: Don’t gawk. If you’re going to freeze it (and you really should freeze it), you’ve gotta ​freeze it right​. You can’t just use any old baggie or plastic wrap, but you don’t have to spring for the fancy and expensive top-of-the-line freezer safe stuff, either. Keep it tight, keep it closed, and it’ll keep for you. Aluminum foil, plastic wrap, or paper wrappings are all pretty effective at keeping the cold out and the delicious in. Wrap it up as tight as you can, and for extra safety, write a date on that bad boy. Wraps are going to work best for your big hunks of food: a giant meatloaf, maybe, or a slab of leftover meat. Bread also freezes and keeps well in a wrap -- just don’t try to freeze the peas this way. Ah, the Ziplock. Where would we be without it? You can safely, quickly, and effectively freeze just about anything in a good ol’ ziplock bag. Throw in your extra fresh herbs, berries and veggies, meat scraps, and even soups (just probably not in the same bag). Be warned, though, ziplocks aren’t the very best for long-term storage. Try and use their frozen insides within a couple of weeks, depending on the type. And a pro-tip: freeze your soups and marinades and wiggly things lying flat on the floor (or on a shelf) of your freezer. Soon, they’ll be frozen solid in a handy little brick, the perfect space saver. And, as always, mark that sucker with a date! You don’t need to be digging around all day trying to find a bag of veg that you vaguely recognize from this decade! They’re handy, but they might not be for long. Thin plastic containers with snap-on lids are a great freezer filler in a fix, but over time they get those cracks that give your foods the burns. Use ‘em a couple of times, take them to your friend’s house for a party and don’t worry about getting it back, or start using them as pencil holders when their days as freezer containers are numbered. These are enormous, they have lids, and you can just chuck ‘em when you’re done. What more could you want? If you’re transporting whole meals and really don’t trust your family and friends to return your fancy Pyrex, this is the choice for you. Classic, stylish, and safe, glass containers with good sealing lids are the ultimate in frozen food storage. If you want to have frozen food ready to go at the start of the next century, use glass. Just make sure the lid is sealed on tight before you close that freezer door. Use a jar, a bowl with a tight-fitting lid, or a Pyrex container, it’s all good. It’s getting pretty fancy now. If your freezer game is super on point, invest in one of the big guns. Vacuum sealing will extend the freezer life of your food by a crazy-lot, and, because it’s getting rid of almost all of the air in there with your food, it practically eliminates any freezer burn potential. Bingo! How Frozen Is Frozen, Really? Full disclosure, if you don’t have your freezer set to the right temp, a minor freezer disaster is in your future, no matter how good your wrap game is. If your freezer isn’t full service, you’ve got some options. One, buy a little thermometer to sit in there all the time. Done. If you’ve got something against buying thermometers (or need to know your freezer’s temperature faster than you can make a Target run), take a look under the lid of the freezer’s favorite staple: ice cream. If that delicious treat is anything other than a brick of joy (like it’s kind of melty or mushy), your freezer is too warm. Turn it down, man. Or, if you’re feeling a little more industrious, check out the video below. Now is your chance. Stock up on those great deals at the supermarket, wrap it all tight, and freeze to your heart’s content. So you shelled out cash for designer cabinets and fancy countertops. What's left? How about a Haier freezer to match your built-in refrigerator? If you like buying in bulk, pre-cooking all of next week's meals, or stockpiling for a rainy day, a standalone freezer is a savvy food-storage solution. Freezers supplement the refrigerator's freezer unit that's already in your kitchen while alleviating overcrowding in the central storage unit. What should I look for when purchasing a freezer? What is the difference between a chest and upright freezer? What is the average price of a good freezer? How do I maintain my freezer after purchase? 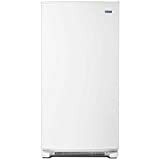 Haier HF35CM23NW 3.5 cu. Ft. When shopping for a freezer, you need to figure out the type of standalone freezer you want, which depends on your storage needs and floor space. You also need to consider size, energy use, capacity, cost, and the kind of features you're looking for. Haier freezers come in different sizes with all the bells and whistles, so one of them is sure to be a fit for your refrigerating needs. All of the Haier freezer models are products of the Haier Group, a leading global provider of better-life solutions since 1984. Haier's white goods business brand is more famous than others in its range of solutions and has been so consecutively for nine years. Among the first things to look for is a sticker that shows it has the approval of safety associations including CSA, ANSI, ASTM, CPSC, UL, or the equivalent. Be wary of buying freezers made in China as their regulatory standards aren't similar to those in the United States. Other safety features to consider are sealed cooling and electrical components, plus anti-tip technology for upright freezer models. Locks and latches are also important, especially to keep children safe, so they're a nice feature to have on your freezer. If you purchase a Haier freezer with a warranty or a registration card, complete the form and send it to the manufacturer. This ensures that in case of any recalls or other relevant safety information concerning your model, you will get notified. Most people tend to skip this essential yet crucial safety step. Make allowance for space and clearance requirements needed for safe installation of your freezer. It should get a dedicated spot on your electrical circuit to prevent power surges and other electrical issues. Standalone freezers come in two choices: chest or upright. Chest freezers have a lid on the top and with a deep storage compartment. They come with either a single or double basket for keeping items easily accessible at the top of your freezer. Chest freezers are more spacious than uprights, and tend to be slightly more energy efficient, and less likely to freezer burn your food. Their temperature also stays lower consistently as they don't self-defrost, and tend to keep food frozen longer when there are power blackouts. However, they can be hard to organize, and retrieving items at the bottom of the chest is often difficult. They also take up more space compared to upright models and rely on manual defrost, which is time-consuming. Upright freezers stand upright like a refrigerator with a door that swings open and shelves inside. These are popular for their ease of storing and finding food but could cost more to operate. They take up less floor space, are easier to organize, and you have the option of self or manual defrost. However, the shelves and bins take up more space, and they make food more likely to get freezer burn as there's more air to circulate around the food. Refrigeration experts recommend that you store food in freezers set to 0°F or below. This helps prevent harmful bacteria from growing. However, freezer temperatures fluctuate depending on seasons, so you need to adjust controls appropriately to ensure you maintain the interior temperature at 0°F or below. If your freezer doesn't have a pre-installed thermometer, you can buy a separate one to make sure you store food at safe temperatures. Always clean up spills immediately to prevent risks of foodborne illnesses and bacteria growth. Before installation, read the manufacturer's instruction manual on installation, use, and cleaning of your freezer. Because we weren't in a position to test each Haier freezer physically, we put in hours of research, reading about the best selling freezers by Haier, as well as rival brands competing for the top slot in the consumer market. We considered customer reviews, warranties, consumption, pricing, and availability which narrowed down our list to just four of the best Haier freezer models. With the above tips and essential factors in mind, in no particular order, here are four of the top Haier freezers with the best features and average customer ratings and reviews. This Haier freezer features an upright design that saves on space and fits practically anywhere. It offers extra storage for perishable items and frozen goods, so if you get surprised by guests, you always have some backup snacks and meals. The removable basket provides easy access for items you use frequently, as well as good organization. It also has a built-in defrost drain that lets water run-off easily, making this pesky task mess-free. Its adjustable thermostat control feature lets you adjust temperatures to suit your needs. If spending a pretty penny isn't in the cards for you when looking for a freezer, this chest freezer is an ideal choice. Customers who reviewed the Haier HF50CM23NW chest freezer love it for its quietness, size, and price. However, some say they'd like to have more bins to organize their items. The Haier 7.1 CU FT Chest Freezer is also ideal for long-term storage and holds about 250 lbs. of frozen foods. It features a security lock (with key), defrost drain, Adjustable Temperature Control, Power-On light, and storage basket for smaller items. It is reliable, easy to use, easy to defrost, and saves on space. 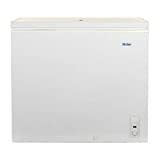 Customers who reviewed this Haier freezer say it is handy, quiet, holds a zero temperature and doesn't frost up. However, some say it is short-lived despite being a good freezer. This Haier freezer provides storage space for up to 125 lbs., which is enough to accommodate all your frozen goods needs. It features a Power-On indicator light that lets you know the freezer is working. An easy access Defrost Drain Front drain makes for quick and effortless draining and the removable basket allows for flexibility as you arrange the items in the freezer. It also has an adjustable thermostat control to change temperatures. Some customers say its size is excellent, its easy to open and close, and keeps food frozen well. However, some users say it is noisy and gurgles a lot, while others have received the freezer with a few damages to the item. The Haier HNSE04BB freezer has a roomy capacity, a half-freezer, and full-width glass shelves that offer a variety of storage options. It also has six-can door storage in which you can keep your favorite drinks chilled, plus space for two-liters and tall bottles on the door. Happy customers love this Haier freezer for its space and quietness. It essentially provides all the benefits of a mini-fridge that you would expect. Some tend to differ and say it makes a frequent loud banging or pop noise, which is part of the defroster. Others add that the can rack is unnecessary and wasteful of space. There are several brands comparable to the Haier Freezer. The three most closely related to it are the Magic Chef MCUF3S2, Whynter CUF-110B Energy Star, and Danby DCF072A2WDB-3 DCF072A2WDB1. Let's see how Haier stacks up against the competition in function, features, size, and price. 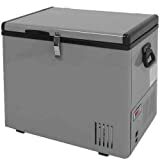 This is an affordable chest freezer that's roomy compared to many chest freezers and costs much less than its counterparts. It features a stainless door with a sleek and clean look, adjustable temperature control, reversible door, recessed door handle, wire shelves, and manual defrost option. Its flush back design helps save on space whether you're using it at home or in your office. One happy customer commented that she loved its size, space and that you can cram in about double the amount of items with some planning. She also said it arrived well packaged, is quiet, lightweight, and easy to keep clean. However, a dissatisfied customer commented that although it works, it is extremely loud. If you're looking for a small freezer for a tiny space, maybe on a side table, your dorm room, or in an RV, the Whynter CUF-110B freezer is a great pick. It features an Energy Star rating, 1.1 cubic feet of space, and fits in tight quarters. Inside is a removable slide-out wire shelf, mechanical temperature dial, and ample space for keeping frozen dinners and ice cream. The swing door is reversible and lockable with a recessed handle. Customers who have used this freezer say it is a great size if you don't have much to stock up on, it is quiet, efficient, and helps keep energy costs down. Some who haven't had a good experience with this freezer say its compressor takes up a significant amount of space, plus it has on one occasion or another arrived with a small dent. Danby brand has a simple vision: to create brilliant and inspired appliances that fit in your space, with your every move. This dependable Danby chest freezer is a great addition to any home. It features a front mount thermostat, manual defrost, sliding storage basket, long power cord, and a 12-month limited warranty with home service. One satisfied customer commented that it is an excellent product, though it didn't have an interior light, it is frost free and energy efficient. A dissatisfied customer commented that it stopped working after just one week of using the freezer and that the company falls short in its customer service. While each Haier freezer is a high-quality household appliance, they too have their pros and cons. All of the Haier freezer models we reviewed seem to check all the right boxes for having all the necessary features of a good freezer. However, some customers have said it could use a few extra storage baskets. Others say the noise and gurgles among some of its models are a total letdown. Compared to its rival brands, the Magic Chef, Danby, and Whynter freezers, all of the Haier freezer models are high-quality appliances. It can be used in any space and can meet your storage needs depending on how much you're looking to store. Do you like prepping a lot of meals ahead of time? Perhaps you have a big family to feed and need to store large quantities of food. You’re frustrated with your refrigerator-freezer because the freezer is just too small for your needs and you don’t want to dig in a chest freezer every day. 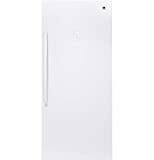 Have you considered buying a Frigidaire FFFH21F6QW upright freezer? What Is a Frigidaire FFFH21F6QW Freezer? What Do Customers Think of Frigidaire’s FFFH21F6QW Freezer? How Does the Frigidaire FFFH21F6QW Compare to Other Brands? An upright freezer has advantages that a chest freezer does not. For starters, it’s far easier to organize an upright freezer. The shelving systems make organization and visibility simple. You don’t have to worry about digging for food every day. They also have smaller footprints than chest freezers, which is a bonus for anyone with limited floor space. Give Frigidaire a look. This just may be the solution to your food storage problems. 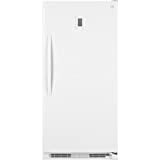 A Frigidaire FFFH21F6QW is a 20.5 cubic foot upright freezer. Unlike a chest freezer, which opens from the top, an upright freezer opens from the front like your refrigerator-freezer. These freezers also have shelving systems inside that you won’t find in a chest freezer. This reduces their usable space but makes them far easier to organize. Frigidaire’s FFFH21F6QW has an exterior height of 72 3/8 inches, a width of 34 inches, and a depth of 27 1/2 inches. Its interior is 65 1/8 inches high, 32 inches wide and 24 3/8 inches deep. It has an overall interior capacity of 20.5 cubic feet and a total shelf area of 13.1 square feet. This freezer also comes with a retractable pizza shelf, one mid-level basket, three adjustable door bins, two full-width baskets, four adjustable glass shelves, and LED lighting. It’s a frost-free freezer, which means it has an automatic defrost cycle. You don’t have to worry about taking time to defrost this freezer manually. You’ll also have the benefit of both a high-temperature alarm and a door-ajar alarm. Ideally, these will tell you whether there’s a problem before it spoils your food. The Frigidaire FFFH21F6QW comes with digital controls and a digital display and gives you the option of displaying temperatures in either Celsius or Fahrenheit. The temperature is adjustable and will run from -10 to 10 degrees Fahrenheit. People who purchased this freezer generally have positive things to say about it. For one, customers like the spacing between the shelves, which makes organizing their food very easy. The LED lighting, they say, is bright and makes finding things inside easy without the heat of an incandescent bulb. Several customers mention enjoying the ice cream drawer. Unless you like your ice cream super hard, you probably have to let it sit out for a while before you scoop it. Or perhaps you put it in the microwave for a few seconds to soften it up. With this drawer, ice cream stays at a constant temperature that’s ideal for keeping it soft but frozen. It seems hard not to like that. Some customers say that the high-temperature alarm is too quiet to hear if you’re too far away from your freezer. That’s mainly a problem if you keep your freezer in the basement or garage, as many people do. Another primary complaint is the door seal. Many customers have moved the entire freezer just trying to open the door. Several customers are unhappy with the number of door bins. Many feel that there just aren’t enough, but they have incredible difficulty ordering more. One customer mentioned having to order them through Frigidaire’s website after the fact. This problem makes the freezer even more expensive than it already is. This is a big freezer with a lot of features. Because of that, it’s not cheap. You can buy this item on Frigidaire’s website. 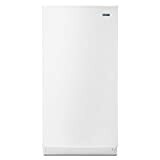 Retailers such as Amazon, Home Depot, Lowe's and Sears also sell the Frigidaire FFFH21F6QW. Electrolux’s major appliance warranty covers all Frigidaire appliances. The warranty guarantees an appliance “free of material defects of component malfunctions.” This standard, limited warranty also covers repairs for problems that occur within one year of purchase. You can also buy an extended service agreement, which will give you up to three years of repairs and access to Frigidaire’s factory-trained repair technicians. They will come out and fix any covered problem with parts designed specifically for your freezer at no cost to you. Furthermore, if they can’t fix your freezer, they will replace it with a brand-new one. The extended service agreement even comes with a money-back guarantee. If you’re unsatisfied, you can get a refund on the unused part of your service agreement, minus the cost of any repairs already performed. You can't make a well-informed decision without knowing about other freezers. How does the Frigidaire FFFH21F6QW stack up to its competitors? Maytag is a well-known competitor of Frigidaire. While they don't have an upright freezer that's the same size as Frigidaire's, they do have one that's very close. Maytag's 20 cubic foot upright freezer is a much more basic freezer than Frigidaire's, though. It's frost-free and comes with bright LED lighting. However, it only has four shelves and doesn't have an exterior display or power-on light. It also doesn't have features such as a pizza tray or a soft-freeze drawer for ice cream. Maytag's freezer does have fast-freeze technology, meaning you can freeze new food very quickly. Frigidaire's FFFH21F6QW will also freeze food quickly, but Frigidaire doesn't advertise any fast-freeze technology. Customers like its spacious interior and the features it has. Some also say that it's quieter than Frigidaire freezers, and doesn't run all the time. However, it can be prone to early wear and tear, and some don't like the fact that it only has four shelves. 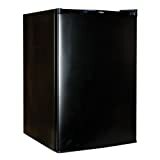 Maytag sells this 20 cubic foot freezer on its website, and Home Depot's site carries it as well. Despite the limited features of this freezer, it's nearly comparable in price to the Frigidaire freezer. In other words, you get less value for the price you pay with Maytag. Sears owns the Kenmore appliance line, and it, too, is a well-known brand for major appliances. Kenmore has a 20.5 cubic foot freezer, making it the same size as the Frigidaire. Kenmore's freezer doesn't have quite as many features as the Frigidaire FFFH21F6QW, but it has more than Maytag's. Kenmore's 20.5 cubic foot freezer comes with a total of four shelves and baskets, and six door bins. As we discussed above, one of the chief complaints customers have about Frigidaire's upright freezer is that it doesn't come with enough door bins. They would like to see four to six door bins, which the Kenmore freezer has. Like Frigidaire, Kenmore's freezer has a soft-freeze zone, meaning you can soft-freeze your ice cream in either freezer. It's also frost-free and has a digital display, and it's Energy Star rated to boot. Customers rated Kenmore's freezer similarly to Frigidaire's on its space, its temperature display, and its lighting. The primary complaint seems to be that the high-temperature alarm is way too quiet, again, similar to complaints about Frigidaire's FFFH21F6QW. Sears sells this freezer on its website, and so does Amazon. Whirlpool's most comparable upright freezer is only 19.7 cubic feet, making it smaller than Frigidaire's, Kenmore's, and Maytag's. Even so, it's packed with features. It comes with four slide-out shelves, four door bins, and one basket. This freezer is also compatible with ice makers and has fast-freeze technology, unlike the Frigidaire FFFH21F6QW. Its electronic temperature control makes it easy to set a temperature that will work best for the kinds of foods you store. It's smaller size is its main limitation when compared to Frigidaire, Kenmore, and Maytag. While customers generally rate Whirlpool's freezer well, there seem to be more complaints about its quality versus that of Frigidaire's FFFH21F6QW. Some complain that it hasn't worked right from the moment they bought it, and others complain about having to have repair technicians come out multiple times just months after buying it. There's also a question of whether or not the temperature display is accurate. One customer on Home Depot's website says that their freezer regularly runs two to four degrees colder than the display's reading. ​It's cheaper than Frigidaire's FFFH21F6QW depending on where you get it, which might seem like a bargain given all its features. Since it appears to be of considerably lower quality, you might want to steer clear of this freezer. General Electric (GE) has two upright freezers that are slightly bigger than anyone else's. The primary differences between the two are their organization systems and whether they're Energy Star rated. They both have digital temperature controls and displays, are frost-free and have LED lighting. GE's FUF21DLRWW, which is its "deluxe" freezer, has four glass shelves and four plastic door bins. It also has three slide-out baskets in the bottom. Their FUF21SMRWW has four wire shelves and four plastic door bins. It also only has one slide-out basket. Both freezers only have two interior shelves that are adjustable, though. Furthermore, Sears says that this freezer is "garage ready," meaning it should operate well at temperatures ranging from 0 to 110 degrees Fahrenheit. Customers love GE's spacious interiors and the organization systems, as well as the lighting. However, like the Whirlpool freezers, this one also seems to have quality problems. Many customers on GE's website complain of their freezers quitting within 90 days of purchase, or of having problems from the start. Another primary complaint is difficulty working the control panel. This freezer looks like a better deal than Frigidaire's FFFH21F6QW, but be aware that you may get a lemon. People generally feel this is a good freezer, but what are the pros and cons of owning one? We've listed some below to help you make a better decision. We gathered information on this freezer from Frigidaire’s website, including its specs and price. For comparisons, we went to the websites of the four brands with which we compared Frigidaire’s FFFH21F6QW, and we used Amazon's, Home Depot's, Lowe’s, and Sears' websites for pricing and comparison information. We went through customer reviews on Amazon and on websites for Frigidaire, Home Depot and Lowe’s to gauge how people feel about this freezer, and used that information to develop our list of pros and cons as well. Frigidaire is a reliable brand with a good history behind it. Their FFFH21F6QW 20.5 cubic foot upright freezer is a high-quality freezer with some great features. It allows you to organize your food in ways that a chest freezer doesn't, and takes up less floor space than a chest freezer. While no product is perfect, we believe that this upright freezer is a good solution for anyone who needs more space than a standard refrigerator-freezer can provide, but who doesn't want or can't use a chest freezer. Are you in the market for a new freezer? A Maytag freezer may be exactly what you need for your kitchen! Read on to find out more.